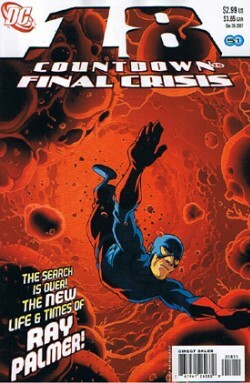 Back-Up Story: "The Origin of Dr. Light"
Ray Palmer, has flashbacks of past events, pre and post Identity Crisis. How he selfishly ran away when his friends needed him most and left a boy in his place. He wakes up next to his wife Jean. He's rebuilt the life he once had and ruined and recreated it without mistakes on Earth 51. Where all other Earths had made mistakes in their own ways, apparently Earth 51 was absolute perfection - (hmm, where's Superman Prime then if that's the case???) and Ray Palmer couldn't give a damn about Sue Dibney or Ralph or his JLA team mates because he was in Utopia. - Damn us all too hell. LITERALLY 5 seconds after turning tail and running away from a lonely tearful Mark, Eclipso is back... and again tries to steal the Marvel power. Cue indentical dialogue from two weeks ago. "You just wanted my power"
"I could have given you the world"
"You want all my power? - Here!" "No I must run away again!" Ray is seeing his psychiatrist, a clinically obese Zatanna who's given up magic and her JLA duties to work with Harleen Quinzel counselling emotional disorder sufferers. They chat about nothing and Ray gives her a Christmas present - a rabbit and top hat key ring. Aww. Then we jump to Christmas where everything is so vomit inducing its almost like DC has suffered a corporate takeover by Disney. Ray is collecting wood for the fireplace when he spots the Challengers appear from the shadows. The jig is up... Ray comes clean. He had deliberately shrunk himself after Identity Crisis and when he became subatomic he met a mysterious mystic woman who revealed the events of 52. So he gained the power somehow to travel between worlds just like Superman Prime. He travelled around and it's hammered into our head again that Earth 51 is perfect. He also found that Ray Palmer of Earth 51 had discovered the mysteries of the universe but while creating a stargate he was killed. Selfish pig Ray naturally decides he's out to assume this Earth's Atom and live his life while also stealing his work. He also manipulated people for his own gain and tricked Jean Loring into a relationship she was never meant to have on Earth 51. Life was perfect but it slowly begins to dawn on his Disney family that that were being played for fools. Bob interrupts revealing he knows what Ray stole from his Earth 51 namesake and what it means for the multiverse. Donna quizzes Ray about the secret but Bob decides talk is cheap and raises his hand glowing with energy in what appears to be a killing blow. Dr. Light desired, wealth and power. Using inventions of destruction that utilised the power of light he came to fight the JLA of several occasions. In an act of retaliation he broke into the JLA satellite and upon discovering the League had left the satellite unattended save for Sue Dibney. He seriously assaulted Elongated Man's wife and the League were enraged. Zatanna used her magic to mindwipe the hideous crime from existence but in doing so erased some of Dr. Lights intelligence. Now he's even more powerful than ever before. Story - 4: Countdown is getting better and better as it nears the end. No I'm not being cheeky. As the fixes are finally taking effect and Dini and co's work is being rewritten and redeveloped, it is suddenly picking up the pace it ought to have had from week 51. Much like Civil War and WWHulk made me despise Iron Man, Countdown and The All New Atom have successfully made me hate Ray Palmer and wish he'd never get another shot at a book of his own. As much as I wish Bob will strike a blow it's likely his actually ready to teleport. The one point I knocked off is for two storylines this issue. Firstly Mary Marvel and Eclipso... are they stuck in a loop? The last six weeks of their story seems to keep repeated more than brussell sprouts... The other storyline is the scene with Zatanna... what was the point? Art - 4: The artwork was swings and roundabouts this issue, in some places it was beautiful and in others rushed and heavily inked. It started off strongly and somewhere in the Mary Marvel sequence took a sharp dip in quality and just like that it jumped back up again. Back-Up Story - 1: Really this is just a recap of Identity Crisis and the good Doctor becoming even more evil. Yawn. Still for drumming points into our heads for the third time this issue alone and ensuring we're very clear on Identity Crisis and the events recently it does the job. Back-Up Art - 5: I love when an artist takes the time and effort to bring us hand painted artwork. Fantastically done, a shame it is art wasted on a dull two page history filler. Cover Art - 4: Love the cover. It is very slick if a bit cartoonish but it is nice that the covers finally have a continuous flow of quality and a sense of style that was previously lacking. The cover got me excited and then the story inside made me utterly hate the character! Still doesn't change the fact the cover is so beautifully composed and thankfully its not Mary Marvel AGAIN.